It can be difficult to choose the right cleaning company and we have designed this page to make that process a bit easier for you. We are here to serve you and help you check “the cleaning” off your “to-do list” so you will have more time for other things: like family, friends, work, etc. For more than 15 years, we have been the number one house cleaning company in Alexandria, VA. Additionally, we are proud to announce that we have been awarded with a Super Service Award 2017 thanks to maintaining a superior service rating on Angie’s List. Our company pays special attention to the details of every project to ensure the complete satisfaction of each client. We do not believe in cutting corners. Our main goal is to leave your home as shiny and clean as possible. We strive to exceed all standards. When you send us a email, we’ll reply in a timely manner. If you give us a call and we don’t pick up, please know that we will return the call as soon as possible as long as you leave a detailed message along with your name and phone number. We pride ourselves in providing maximum service. We have over 100 reviews on Yelp along with other reviews posted on various social media outlets. 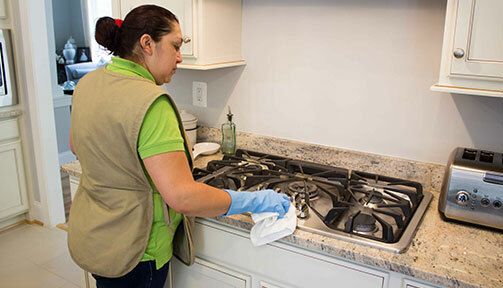 We have remained one of the top cleaning services in the local DMV area since we opened for business. We are Licensed, Bonded & Insured. Our staff has underwent training and screening to ensure that we have an exceptional team by our side. Most of our staff members have been with us for over 10 years, so you’ll always see familiar faces on our team. Yes, we are pet friendly! They are part of the family, and we have no problem working around them, as long as they are trained. What is great about our company is that we use NON-TOXIC cleaning products, which will be safe to use around them. Not satisfied with our service? Notify us within 24 hrs of your scheduled service and we’ll send back the crew the next day to remedy the deficiencies. If you’re still not satisfied, we’ll do a site visit and inspect the area of concern until we reach a solution.